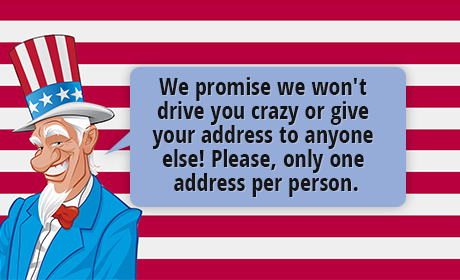 Our top requested item in 2011, the Made In America bumper sticker is now available. This hexagon-shaped, die-cut sticker is a fun way to show those around you your patriotism and looks great on any car, or window, ideal for both home and office. This re-usable adhesive bumper sticker measures 5.8" x 4.8" and will let everyone know that you support America and American-manufacturing. 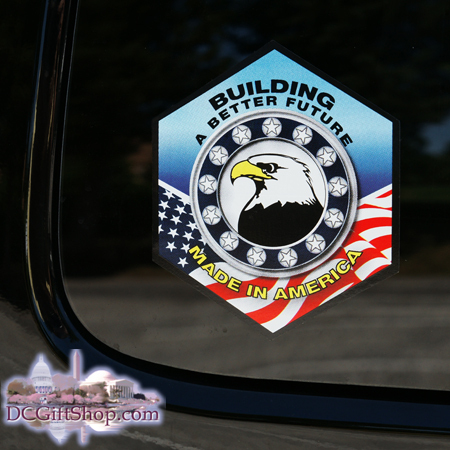 The Building A Better Future: Made In America sticker features the American Eagle surrounded by the American Flag. This colorful symbol of American pride is a great way to display your patriotism. All inks, dyes, and vinyl are sourced in the United Sates. The weatherproof Made In America sticker also has a .001 clear UV blocking over-laminate applied for better life "out in the field." Makes a great window, bumper, cooler, door or just about anywhere-you-can-think-to-place sticker. FREE SHIPPING FOR THIS ITEM!! !